315 people have liked this story. A huge dog with a major injury. Those are the two strikes Volker, the Great Dane mix, had against him when he arrived at the Washington County Humane Society with a broken leg. His injury was so severe, the staff had to act fast or he would die. They decided to use the Society's Animal Relief Fund (ARF), a fund designated specifically for serious medical and behavioral care. Out of the more than 1000 animals that come through the shelter every year, only five to fifteen animals can be saved by ARF. Volker had won the lottery. That leg took six pins, a $5,000 surgery, and three ER visits, but it healed, and he lived. "Volker reflects our mission statement of providing shelter, safety, and food for the orphaned and abused animals of Washington Area, with the goal of placing the animals in a loving home," said Kelly Proudfit, executive director of development, marketing, and events for the Washington Area Humane Society. "Volker was a perfect example of that." But Volker's story was not finished. He had won the battle against the injury, but what about a new home? What about the fact that people don't often adopt a dog as big as Volker? It was nearing Christmas. Not far from the shelter, a couple was having lunch at a restaurant. As they ate, they remembered their dog, who had passed over the rainbow bridge a year before almost to the day. On the spur of the moment, they decided to stop by the humane society and take a look. When they had left the house that morning, getting a dog was not on their agenda. For the second time, Volker hit the lottery. 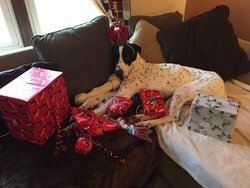 In her words - "We got down to the very end and we see this huge dog in the smallest space.We went home and I said to my husband we cannot let Volker be there for Christmas and he agreed. We both rushed back to fill out the application. We couldn't get him out of our minds... He just needed love." Volker is home. But there are approximately sixty other dogs still living in limbo, waiting. Because the Washington County Humane society is a no-kill shelter, it means they can only accept another dog or cat when a space becomes available. So when you adopt a dog, you save two lives- the one you take home, and the dog that can take its place.